Christmas is a magical moment to enjoy our destinations. The streets look like never before, there are multiple activities to participate with the smallest, unique craft spaces … Here we present the most important activities that take place these days in Bilbao, Vitoria-Gasteiz, San Sebastián, Hondarribia and Irun and Zarautz. • The “Light” of Christmas, a large ball of lights next to the City Hall of Bilbao of 6 meters in height and another 6 meters in diameter. • Walking guided visits on Christmas in Casco Viejo and Ensanche. • New Year’s Eve form Bilbao with the offer of the ‘cotillones’ of the city. • More than a dozen nativity scenes of different format, styles and themes in the Museum of Steps, in charge of the Belenista Association of Bizkaia. • Bailén street Christmas market with more than 40 booths with crafts, Basque products and typical gifts. • Ice rink in the La Casilla Pavilion. • Exhibition of Rolls-Royce-A century of style at the Euskalduna Palace with a selection of cars of this brand that belongs to the Miguel de la Vía collection – Torre Loizaga, unique in Europe. • Izenabadua Basoa The House of the Olentzero, in the Landetzo Goikoa farmhouse in Mungia, where the Olentzero collects letters from children. • Christmas Children’s Park (PIN) in the BEC with a wide range of games, sports activities, workshops, traditional barracks distributed in two pavilions. 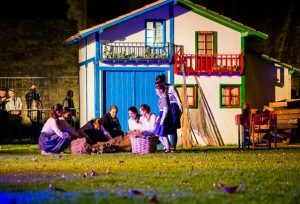 • At the Euskalduna Palace: the musical for the whole family of ‘Oliver Twist’, the concert of India Martínez, the show in Basque Pinotxo, the ‘Carmen’ by Salvador Távora, Pirritx, Porrotx eta Marimotots, the magic of Drakis, Los Chicos del Coro, the children’s show of ‘Beauty and the Beast’, the choir, ballet and orchestra of ‘Russian Army of Moscow’. • Also at the Teatro Arriaga the Izar-Estrella show. • Gabonak Arte aimed at children from 5 to 12 years old in the third building of Azkuna Zentroa to promote their creativity and non-sexist and cooperative values in a playful environment. • San Silvestre race with start at the Guggenheim Museum Bilbao. • The sale of the sweets of the convent in the Museum of Sacred Art. • The Basque Mythology exhibition at Bizkaiko Foru Liburutegia with the characters that fill our culture with legends and adventures. •	Outdoor ice rink on the Virgen Blanca and slide. • Monumental Bethlehem of the Florida park. • Christmas crafts market in the Plaza de los Fueros. • Lan ta Lan Fair of crafts in the Plaza de la Provincia. • Christmas market for agricultural products, in front of Plaza de Abastos. • Christmas Children’s Park at the Hegoalde Civic Center. • Night of the Sails through the Medieval Helmet on Friday, December 22nd. • Chambao’s farewell concert at the Teatro Principal. • Concert by Kukai Dantza eta lagunak / Gwenny (Aitzina Folk) at the Polideportivo de Mendizorrotza and Benito Lertxundi at the Teatro Principal. • Guided tours to the Medieval Quarter or the Literary Route ‘The silence of the white city’ by the author from Vitoria-Gasteiz, Eva García Sáenz de Urturi. • Concert by EGO-Joven Orquesta de Euskal Herria (Young Orchestra of Euskal Herria) at the Teatro Principal. • Visits to the Cathedral of Santa María. • Exhibitions ‘Liquid Cartographies’ and ‘Ke you have a good time’ by Santos Iñurrieta at the Basque Museum Center for Contemporary Art. •	JORGE DREXLER “Ice lifesaver”. December 22, 8:00 p.m.
•	CHORUS, BALLET AND ORCHESTRA OF THE RUSSIAN ARMY OF SAINT PETERSBURG, December 23, Kursaal auditorium, 9:00 p.m.
•	“THE CASCANUECES”. Solo stars of the Bolshoi Theater, Moscow State Ballet and Great Symphony Orchestra. December 26, 8:00 p.m.
•	INDIA MARTÍNEZ: “SECRET TOUR”. December 27, 8:00 p.m.
•	20º CONCERT UNICEF – ORFEÓN DONOSTIARRA Orfeoi Txiki, Orfeoi Gazte. December 28, 7:00 p.m.
•	ALABAMA GOSPEL CHOIR. December 29, 9:00 p.m.
•	GREAT SUCCESSES OF CINEMA MUSIC. December 30, 9:00 p.m.
•	“THE LAKE OF THE SWANS” Stars Soloists of the Bolshoi Theater – Moscow State Ballet and Great Orq. Symphony 2 January, 8:00 p.m.
•	JOHANN STRAUSS GREAT NEW YEAR CONCERT. January 4, 8:00 p.m.
•	DONOSTIA LIVES THE MAGIC “THE BEST WIZARDS OF THE WORLD” 6 January, 7:00 p.m.
•	WELCOME TO BROADWAY. Broadway Symphony Orchestra. 7 January, 7 p.m.
•	LOU TOPET. “PETE SEEGER GOGOAN”. December 27, 8:00 p.m.
•	AMATEUR, DEBUT! December 28, 8:00 p.m.
•	MIKEL ERENTXUN “The man without shade” December 29 at 8:00 p.m.
•	SKY BEATS PIANO TAPES FEAT. PAUL SAN MARTÍN. December 30, 8:00 p.m.
•	EUSKAL HERRIKO GAZTE ORKESTRA. January 3 at 8:00 p.m.
•	Theater “OLEANNA” Pentación – El Cuervo – Txalo Productions. December 30, 8:00 p.m.
•	EXHIBITION CALE, CALE, CALE! CAALE !!! Until February 4. •	HOT EXHIBITION IRON MARGINALIA Adrià Julià. Until February 4. •	THE WALL Intervention during the month of December. •	MONOLOGISTS at the Gastro Bar of Ametzagaña, on the way to Uba 61. Saturdays, December 2 and 16, at 8:00 p.m.
•	Children’s Christmas Park From December 22 to January 4 at the Kursaal center. •	“PinoXXio” Ananda Dansa. Victoria Eugenia Theater. December 23 at 5:30 p.m.
•	“The map of the treasures” Factoría Albaola, Ondartxo Ibilbidea, Pasai San Pedro. Solve the secret that hides the map that you will receive at the entrance and let yourself be guided by our Txo cabin boy. From the 26th to the 30th of December and from the 2nd to the 7th of January. •	Pirritx, Porrotx eta Marimotots 3 January, Kursaal auditorium, 4pm and 7pm. •	“The legend of the lake of the swans” The Factoría de Cuentos. Victoria Eugenia Theater, January 4 at 5:30 p.m.
•	HAUR PARKEA KUTXA EKOGUNEA Animaliak neguan zer? Dramatized story (January 4) Xylophone with glass workshop boats (December 23, 27 and 30) + ACTIVITIES: Winter colonies (December 26 to 29 and January 2 to 5). April Fool’s Day (December 28). 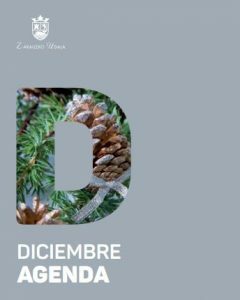 •	EUREKA ZIENTZIA MUSEOA Scientific Workshops from December 26 to January 5. DIVERSE ACTIVITIES for children and young people: Txoko de la Ciencia, Technological Winter Colonies. New in the Planetarium, now also in 3D. Guided visits to the Animalia room. In addition, simulators, shows and animation in the museum. •	Run San Silvestre Donostiarra December 31, 4:00 p.m.
•	2nd Edition of the Kia Novocar Askatuak Cup Days 27, 28 and 29 December, sports centers of Benta Berri and Pío Baroja. • “XI. KOPLA TXAPELKETA” · Spectacle of couplets 22:00 Gaztetxe / Putzuzulo. • “ZARAUTZ SKATE NIGHT” · 12 Km. Mandatory helmet. 20:00 Departure point: in front of the town hall. Lege Zaharren enparantza. • “FIESTA DEL OLENTZERO” 10:30 Activities for boys and girls. 12:30 Rural sport. 16:45 Storytelling. After arrival of the Olentzero. Santuiturri plaza. 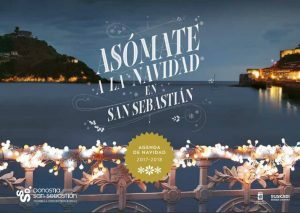 • CHRISTMAS SONGS The Zarautz Abesbatza, Txinpirin and Zarautz Txiki choirs will sing Christmas songs on the street. 7:00 PM Through the center of town. • RELIGIOUS CELEBRATION SING BY ZARAUTZ ABESBATZA Christmas Day. 12:30 Church of the Franciscans. • CONCERT OF THE ZARAUTZ MUSIC BAND Special Christmas concert. 12:30 Market Square (1st floor). • XXXV CHINESE CHILDREN’S CHRISTMAS 16: 30-19: 00 Christmas playground (for the children of Zarautz Egokituz) Aritzbatalde Sports Center. • XXXV CHILDREN’S CHINESE CHRISTMAS · Christmas playground. Inflatable castles (for children up to 7 years old). Games (for children between 8 and 12 years old). Polideportivo Aritzbatalde. • XXXV CHINESE CHRISTMAS CHILDREN AQUATIC GAMES. Polideportivo Aritzbatalde. • GUIDED VISIT “BODEGA DE TXAKOLI” 11:00 Bodega Talai Berri. (With prior appointment). • “AULA” CULTURAL DIFFUSION PROGRAM Lectures, screenings and presentations. Free entrance. 18:00 Photomuseum. • XXXV CHILDREN’S FIFTY CHRISTMAS 4:00 PM & 6:30 PM Performance of the clowns “Pirritx, Porrotx eta Marimotots”. Polideportivo Aritzbatalde. • RELIGIOUS CELEBRATION SING BY SCHOLA CANTORUM New Year’s Day. Bilingual. 11:30 Parish Santa María la Real. • CUENTACUENTOS · “Emozioen zurrunbiloa”. From the hand of Oihana Etxegibel. For children between 3 and 6 years old. 11:30 Imanol Urbieta Music School. • RUSSIAN BALLET SHOW By the hand of the ballet Maria Nicolayeva. Tickets for sale at the Tourist Office. (€ 3) 18:30 Aritzbatalde Sports Center. • CUENTACUENTOS · “Nire etxea zurea da”, stories about multiculturalism. From the hand of Maite Franco. For children between 5 and 8 years old. 11:30 Imanol Urbieta Music School. • Train “Txu – Txu”. Starting point: Lege Zaharren enparantza. • CUENTACUENTOS · By the hand of Itziar Saenz de Ojer. For children between 8 and 10 years old. 11:30 Imanol Urbieta Music School. • BIZAR ZURI “· Postman of the 3 Kings. 17:00 Lege Zaharren enparantza (l Gazteleku). 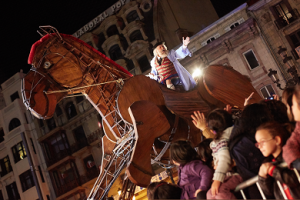 • CABALGATA DE LOS REYES MAGOS 18:30 Around the town center. • MISA CANTADA BY SCHOLA CANTORUM · Three Wise Men’s Day. Bilingual. 11:30 Parish Santa María la Real.